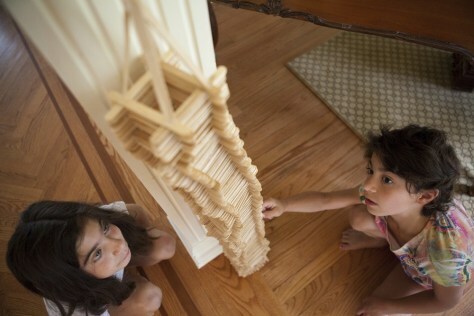 Twins Ariella, right, and Olivia Russin count Popsicle sticks in a replica Ariella built at summer camp of the North Tower of the World Trade Center. Their father, Steven Russin, worked on the 104th floor of the tower, where he worked as an executive at the brokerage firm Cantor Fitzgerald. He died on Sept. 11, 2001. The twins were born four days later, on Sept. 15, 2001.